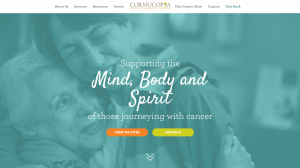 TriMark Digital is proud to announce the completion of Project404, a nonprofit initiative awarding complimentary digital strategy to Cornucopia Cancer Support Center. As part of Project404, TriMark redesigned and developed Cornucopia’s website, www.cancersupport4u.org. Project404 began in the fall of 2015, when TriMark asked the community to nominate causes worthy to receive complimentary digital services, including development, design, video, SEO and content. After receiving over 30 submissions, TriMark narrowed it down to three deserving causes. The “finalist” was determined by a community vote, and in which Cornucopia Cancer Support Center earned the consensus. Cornucopia Cancer Support Center is based in Durham, N.C. and has been making a difference in the lives of cancer patients and their families for over 20 years. The mission of Project404 was not only to give the Cornucopia Cancer Support Center a new, more user-friendly design, but also to make sure the site could be easily found online so that more people touched by cancer could benefit from its free support services.